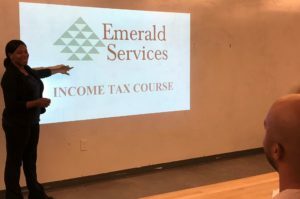 Emerald offers a comprehensive tax course to the general public. Each year the course is available during the last quarter of the year (Oct-Dec). The course teaches the general principals of tax preparation, the IRS regulations, and due diligence practices. This course offers morning and evening classes at our local office, as well as a virtual option. Click Here to reserve your seat! “Your Friendly Neighborhood Tax Lady” will travel to your location to complete your tax return. Please inquire for more details as to restrictions or limitations. Our office electronically files the current and last 2 years of tax returns to ensure a safe and timely process. If you need more time to gather your information and will not file your return by the end of tax season, we can assist with filing an extension with the IRS. This extension gives the client 6 months to complete a tax return without late-file penalties. We can help change current information on your tax return, or attach additional information to your tax return, after it has been filed. An Individual Taxpayer Identification Number (ITIN) is a United States tax processing number issued by the IRS for those who need to file a federal tax return but are not eligible for a Social Security number.